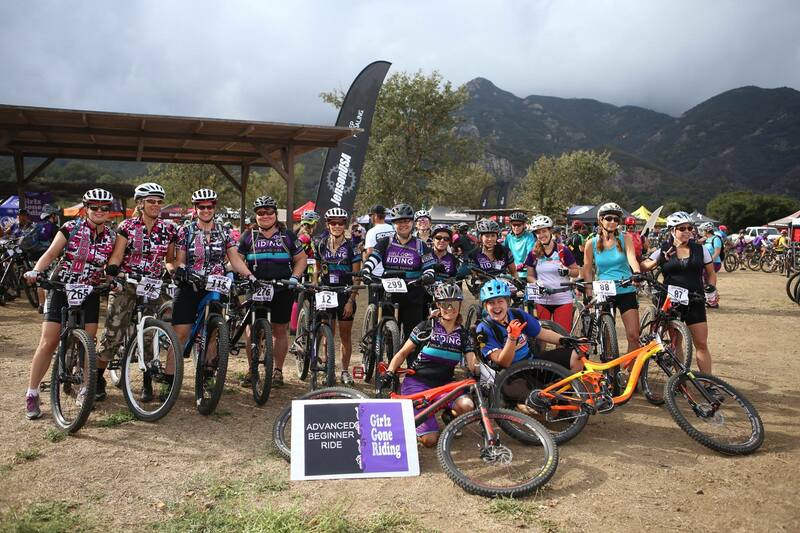 Girlz Gone Riding 2015 Wrap UP! Next year will bring a number of issues to the forefront. The advocacy items mentioned previously will all continue into the coming year. We’ll continue working to bring Bike Skills Parks to Los Angeles. We’ll continue our educational efforts, and to be at the table when decisions are made that affect us or the trails we ride. But there are many things we could be doing better. CORBA remains an all-volunteer organization, though it has become almost full-time for me as President. We could be doing a better job of marketing ourselves and reaching out. 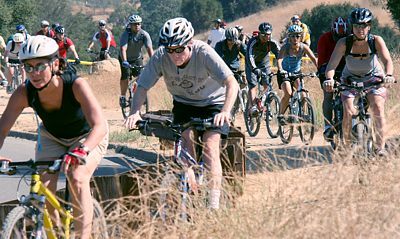 Given the number of mountain bikers in Los Angeles, we should be doing a better job of growing our membership. We could be doing a better job of fundraising, of communicating with our members and the mountain biking community at large. We should have a better web presence. Though we could be doing more, I’m proud of what we’ve done, proud of our volunteers and our members, and hope you are too. To do all these things we need to grow. We need your help, your continued support. You didn’t see a flurry of requests for end-of-year donations from us. You didn’t see a barrage of emails on specific causes. What you saw was a small but passionate crew of dedicated volunteers making a difference. We’d welcome more support, whether it’s in the form of donations: cash, gear, or, most importantly, your time and skills. The easiest way to support us is with your membership. Together we’ll continue to ensure that the greater Los Angeles area is a wonderful place to ride a mountain bike! 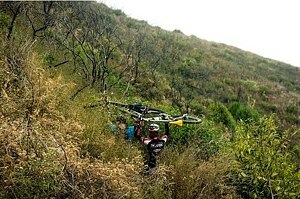 Don't contribute to trail damage! We are having a severe El Nino event this winter; the weather forecast is for many heavy rainstorms that will have seriously bad impacts on our trails. 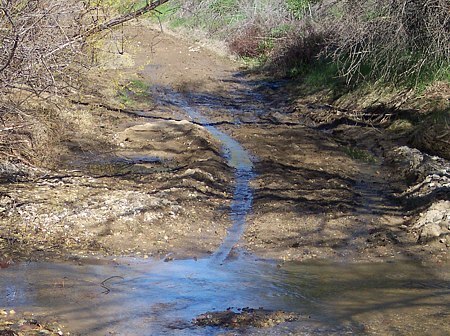 As well as muddy conditions that interfere with their use, the rains could be severe enough to erode some trails into huge ruts, and even wash them away in some cases. There may be more mudslides in Pt Mugu State Park (Sycamore Canyon) like we had last year. Furthermore, the rain will spur the chaparral to overgrow the trails, a condition we haven’t had to deal with much over the past couple of years because of the drought. The combination of waterlogged soil and high winds could blow trees over. We’re expecting to need special trailwork days to repair these damaged trails and hope many mountain bikers will want to help us get them back into shape! 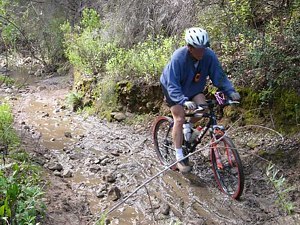 For recreation, most trails should be avoided when they're wet. Bikes make grooves along the trail; the next time it rains, the water runs down these grooves and turns them into little ruts, which become large ruts that destroy the trail. Hikers and horses make holes and ridges in the trail that become as hard as concrete when the trail dries. These holes and ridges are good for twisting ankles. ast January the Forest Service allowed some experienced trail maintenance volunteers, who had been previously certified to use chainsaws at the “A” level, to step up their training to a “B” level. Under current regulations, A level sawyers are restricted to 8 inch trees or smaller, and must be supervised. 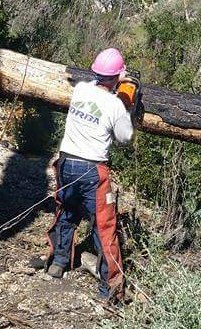 B-level Sawyers are allowed to work unsupervised, on trees up to 24" in diameter, and can supervise and work with A-level sawyers. CORBA President Steve Messer, and volunteer Mike McGuire both received their B level certification, and have been putting them to use all year. Volunteers from the Mount Wilson Bicycle Association (MWBA) and other groups received their A Level certification. 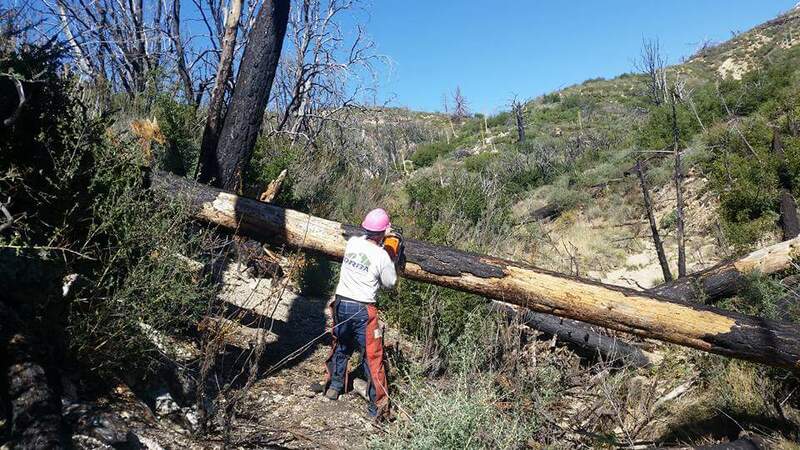 Together the CORBA and MWBA sawyer team have cut over 150 trees from Brown Mountain, El Prieto, Sunset Ridge, Gabrielino, Strawberry Peak, Colby Canyon, Mount Lowe East, Sam Merrill and Silver Moccasin trails. Sunday January 10: Ken Burton Trail. We'll continue working on the Ken Burton trail. Meet at the Windsor/Ventura parking lot, and be prepared to ride to the top of Brown Mountain. Bring long pants, long sleeve shirt and gloves (we'll have some gloves available). Lunch afterwards. So far we've cleared about 1 mile trail, and our goal is to cut the trail through and ready to open by next spring. Please see full details and RSVP for the trailwork on our Meetup group at http://www.meetup.com/CORBAmtb/events/227733450/. 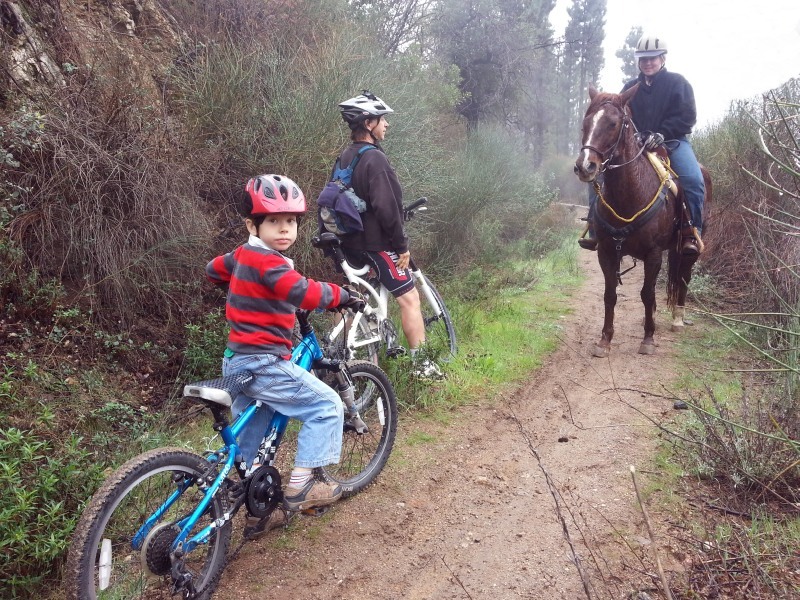 Summary of Previoius Ken Burton Trailwork: On November 6, 7 & 22 and December 13, volunteers for CORBA and the Mount Wilson Bicycling Association (MWBA) worked to restore the Ken Burton Trail that has been closed since the Station Fire in 2009. In the ensuing years, it has become severly overgrown and the condition of the tread was uncertain. Work began in October with the trail being inspected, and in many cases searched for using older GPS tracks. 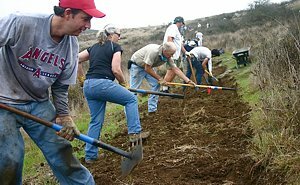 On Saturday Nov 7th, six volunteers came out to begin work on the trail. Just getting to the work site requires a 2000' climb over 7 miles, with several steep, loose sections that are difficult even without pulling BOB trailers loaded with tools. In one day’s work, we were able to clear brush from about a quarter mile of trail, and restore tread on just over half of that. The next day, with the help of MWBA, a crew of 18 continued where we had left off. So far we’ve cleared approximately 1 mile of the trail, about 1/3 of the work. Our tentative dates starting next year are January 10 and January 24. Trailwork due to El Nino: With the upcoming El Nino storms, some trails could be severely damaged. We expect to schedule workdays on short notice to fix such damage and/or to prevent further problems. The year in GGR has really been a spectacular one! Lots of new women riding, improving, trying their hand at racing and the biggest Rocktober showing yet of both participants and exhibitors! We closed the year out with our annual CO-ED Holiday Ride & Luncheon. 40 Riders showed up to enjoy 3 levels of guided rides in the Santa Monica Mountains and have fun at our lunch buffet & gift exchange. This year Susan Hall won the Most Improved Rider for 2015 and was presented with a large purple plaque!